UNITED NATIONS, December 13 -- As not only Puntland but the Transitional Federal Government in Mogadishu move to use mercenaries, the UN is in denial even as its Security Council's sanctions regime is being violated. A full week later, the UN Spokesperson's Office has not provided any information. 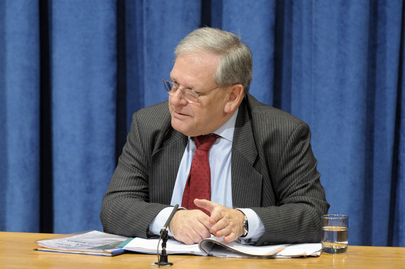 But on December 10, Inner City Press asked the UN's Humanitarian Coordinator for Somalia Mark Bowden about mercenaries. Despite reports that the TFG is moving forward, Bowden said that there's been a step back. Video here, from Minute 13:55. 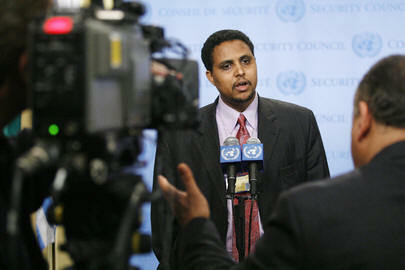 Inner City Press asked if the UN knows the identify of the country funding the mercenaries. Bowden did not answer, but said that the funder should contact the UN Somalia Monitoring Group, or they might be in violation of the sanctions. But the country has indicated it will not identify itself, ostensibly to not suffer attacks. Is there a loophole in the sanctions regime for this? On the UN World Food Program's confidential Memorandum of Understanding with the OIC, Inner City Press asked what it says about paying to deliver service. But neither she nor Bowden have seen the WFP agreement. What does it mean, then, to be a UN Humanitarian “Coordinator” or OCHA Head of Country office? What is WFP doing? Watch this site.